As a white girl from Europe, I recognise my privilege concerning race and want to note that that means there are a lot of things in this book going over my head and that my voice in this discussion doesn't really matter. I encourage you to look for reviews by black teens. This book was a punch in the gut. I'm impressed by how hard it could hit in such a small amount of pages. This is also applicable to the characters, whom all felt very real, despite there being little setup or pages to develop them. It's a very powerful book, partially because of that. It's a quick read that'll hit you hard, and I encourage everyone to read this. In my opinion (again: not really the person you should listen to, why am I even writing this part?) the book dealt with race incredibly well. It's great to see the voice and point of view of a young black boy, as we so rarely get that perspective. It has intersectionality, internalised issues, police brutality, racial profiling, it's obvious that no group is monolith and it always stays both nuanced and true to itself. I loved seeing how Justyce, and to a lesser extent Manny, struggle with comments, knowing how to handle them, with being seen as "too sensitive" or "too aggressive." This also made room for some great black male role models and/or mentors, like Doc (whose character I really liked), Manny's father and Dr. Martin Luther King Jr. I loved that Jus had people to look up to, to go to with questions. That success and struggles were present in those people too, and with that the knowledge that things were possible, but also the reality that things were and would be difficult. 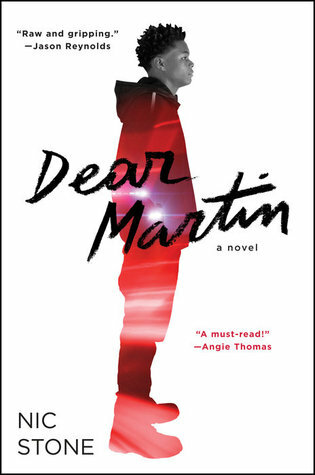 I absolutely loved the idea of letters to Martin Luther King (and that he appeared in the acknowledgements). The formatting of the letters along with the dialogue in transcripts made it very refreshing to read and made it possible to show that much more aspects and sides of the complex situations that Justyce was in. Jared and his friends were so incredibly well-written I wanted to throw something at them multiple times. I'm glad for SJ (who's Jewish) to bring a bit more balance, to stand up for things she believed in, for being an ally and taking some of the fire (and spitting it out). I also thought it was great that there was a scene in which she recognised she did something wrong and apologised for speaking for Justyce. One thing that did bug me slightly was comments along the lines of "you sound like such a girl right now." This happened multiple times and always threw me off because it was (as I remember) hardly ever called out. I felt like that was a missed chance, especially considering that at the start of the book, when talking about equality, SJ talks about how women are not equal to men yet whilst we should be. Those comments are the reason it isn't quite a five-star read. Oh, and on the topic of important books dealing with race, put Tyler Johnson Was Here on your list and buy it when it releases.